This is Tim Keller’s Foreward to BONHOEFFER: Pastor, Martyr, Prophet, Spy. I’m delighted that my friend Eric Metaxas has penned this volume on Dietrich Bonhoeffer. The English-speaking public needs to know far more than it does about his thought as well as his life. When I became a Christian in college, Bonhoeffer’s Cost of Discipleship was one of the first books I read, followed not long afterwards by Life Together. I still think the second book is perhaps the finest single volume I have ever read on the character of Christian community, but it was the first book that set me on a life-long journey to understand the meaning of grace. I now realize how impossible it is to understand Bonhoeffer’s Nachfolge without becoming acquainted with the shocking capitulation of the German church to Hitler in the 1930s. 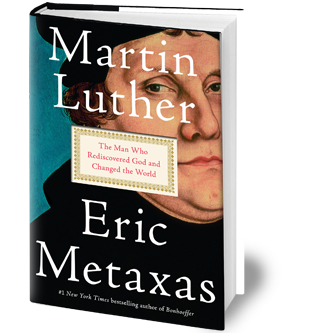 How could the “church of Luther,” that great teacher of the gospel, have come to this? The answer was that the gospel, summed up by Bonhoeffer as costly grace, had been lost. On the one hand, the church had become marked by formalism. Formalism meant going to church, hearing that God just loves and forgives everyone, so it didn’t really matter much how you lived. Bonhoeffer’s name for this was cheap grace. On the other hand, you had legalism, or salvation by law and good works. Legalism meant God loves you because you have pulled yourself together and lived a good, disciplined life. Both of these impulses made it possible for Hitler to come to power. Formalists may have seen things in Germany that bothered them, but they did not see any need to sacrifice their safety to stand up to them. Legalists were more likely to have the Pharisaical attitudes toward other nations and races that approved of Hitler’s policies. Germany had lost hold of the brilliant balance of the gospel that Luther so persistently expounded: “we are saved by faith alone, but not by faith which is alone.” That is, we are saved by grace, not by anything we do, but if we have truly understood and believed the gospel, it will change what we do and how we live. Much of the German church understood ‘grace’ as abstract acceptance — “God forgives; that’s his job.” But the grace comes to us by costly sacrifice. And if God was willing to go to the cross and endure such pain and absorb such a cost in order to save us, then we must live sacrificially as we serve others. So anyone who truly understands how God’s grace comes to us will have a changed life. That’s the gospel, not salvation by law, or by cheap grace, but by costly grace. Costly grace changes you from the inside out. Neither law nor cheap grace can do that. This lapse couldn’t happen to us, today, surely? Certainly it could. We still have a lot of legalism and moralism in our churches. In reaction to that, many Christians want to talk only about God’s love and acceptance. Many of them don’t like talking about Jesus’ death on the cross to take divine wrath and justice. Some even call this “divine child abuse.” All this might run the risk of falling into the belief in “cheap grace” — a non-costly love from a non-holy God who just loves and accepts us. That will never change anyone’s life. So it looks like we still need to listen to Bonhoeffer and others who go deep in discussing the nature of the gospel.